Based on the idea that it’s not what a picture looks like but what it feels like that makes it good, this is a book that manages to be both practical and inspiring. Organised around six key ideas (Shoot the Moment; See the Light; Feel the Rhythm, and so on), it forces readers to see, not just shoot-and it will do it by walking them through the ideas, the techniques and then the projects, all laid out in graphic, beautiful, instructive way: Read about the technique, see it in practice in one of Lange’s photos, and then learn how to replicate it yourself. Underneath it all lies Lange’s real message: ‘The more you appreciate how special each moment is, and see how you can capture its meaning and its mysteries, the better your pictures will be. The moment you appreciate how special it is that you’re all together on the beach, or at a two-year-olds birthday party, or that light is pouring through your bedroom onto the bed where your wife is resting is the point at which your photograph becomes a testament to your way of seeing the world’. 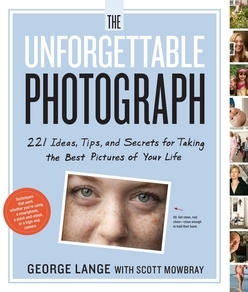 An entirely new kind of photography book: Master portrait photographer George Lange uses his own iconic photo to teach anyone - whether they use iPhones, point-and-shoots, or full sized cameras - the secrets of taking memorable photos with real emotional pull.